I took advantage of a clearance sale at the end of last year on Skirt Sports and scored big. I’d never worn any of their clothes so I wasn’t sure about sizing and a bit skeptical about ordering online without trying them on, but they were too cute and stylish not to try out. Why not look great even in running gear? I ordered the Tough Girl Skirt normally priced at $90 for $36 and the Lotta Breeze Capri normally $75 for $30. See what I mean by deals too good to pass up! I got both in an extra small and they are the perfect fit. They do a nice job on their website describing how the items will fit and include notes if many wearers have said a certain item fits differently than initially described. The Lotta Breeze Capri are like the name says, capri-length with a cute reddish-pink skirt. They have a tight fit that feels a bit like compression gear. I haven’t had many days warm enough to wear the capris outside yet, but they’ve felt great on the treadmill or the elliptical at the gym. 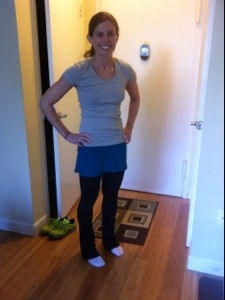 The Tough Girl Skirt is an incredibly soft and warm pair of tights with a running skirt over it. They are tight through my upper legs and have a slight boot cut at the bottom. I can’t get over how comfortable and warm these are and have put them through long runs and track workouts on some pretty cold days. Both of these have two hidden pockets under the skirt that is perfect for storing my keys and gummy candies for long runs. They also look great and super stylish, so I’m comfortable wearing them around to run errands. What a bargain! I’m so glad I happened to click on their site the day of that sale and will certainly buy from them again in the future! 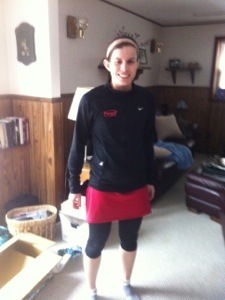 This entry was posted in Fitness, Running and tagged running gear, running skirt, Skirt Sports by Colleen Lerro. Bookmark the permalink.